Nutrition Counseling and Wellness Coaching to help you feel the best you can be. It’s time to cut the food confusion with science! Trying to keep on top of wellness can be tough, especially if you’re already exhausted from your hectic life or busy social calendar. Just when you think you’re on the right track, the cravings kick in. Or new information comes out telling you to go in a different direction. Sometimes it might feel like you’ve tried everything, but you’re not getting the results you want. What you really want is lasting change, and you’ve got the motivation to get there—and yet still somehow you fall off the wagon. So you try something else. And the cycle continues. When your health is taking a backseat to your busy life, it can feel frustrating. But trying to create and maintain the perfect diet on your own can be a huge drain on your time and energy. The good news? If you’re ready to take back control of your health, the hardest part is already over… as long as you have help. Together, we find ways to create sustainable, long-term lifestyle changes so you can feel confident, healthy and independent. Slim down — without unsustainable diets, guilt or an emotional rollercoaster every time you look at the scale. Take charge of your PCOS with the right nutrition and lifestyle changes. There is no “one size fits all” approach — together we’ll create a practical plan that’s personalized to you. Whether you have diabetes, prediabetes, high cholesterol, IBS, or symptoms of menopause, find a nutrition & lifestyle solution to improve your health or control your symptoms. Whether you are looking for a keynote speaker, radio or video presence, I would love to bring my vast knowledge on how to live healthy in a busy world. Look beyond what you eat at the big picture, including sleep, stress, exercise, emotional health and your other habits. Problem-solve as we go to conquer your particular challenges and achieve your unique goals. Provide practical advice for real-world situations of balancing a healthy diet with a busy lifestyle. Provide clarity around the confusing, sometimes contradictory health information that is out there. Weight loss … plus energy! I lost 30 pounds in 8 months on your plan. And even better, my HBA1c went from 7.5 to the normal range! I avoided staying off medication which was of my major goals. You made it easy by keeping in the foods I like to eat. No diet or gimmicks. I have more energy than before yet as just as strong when I weight train. Thank you! Martha will not lose the weight for you, but she is a great coach and knowledgeable expert in her field. My personal experience of losing fifty pounds and keeping it o made my seventieth birthday much sweeter that it would otherwise have been. I expect to continue consulting for another year to firmly establish my healthy lifestyle. I enjoyed our meeting, and your ability to simplify my NEW EATING HABITS, into 15 gm carbohydrate segments. This is so easy! With your explanations, you have made it so adaptable to everyday city life. We have different metabolisms, genetics, lifestyles, activity levels, even gut! What works for someone else may not work for you. Keep your mind and options open. Focus on making small changes. We’re not aiming for perfection here! I don’t believe in omitting foods unless that is what YOU want to do. Find inspiration and sound science for weight loss, PCOS and other conditions to bring health to life. 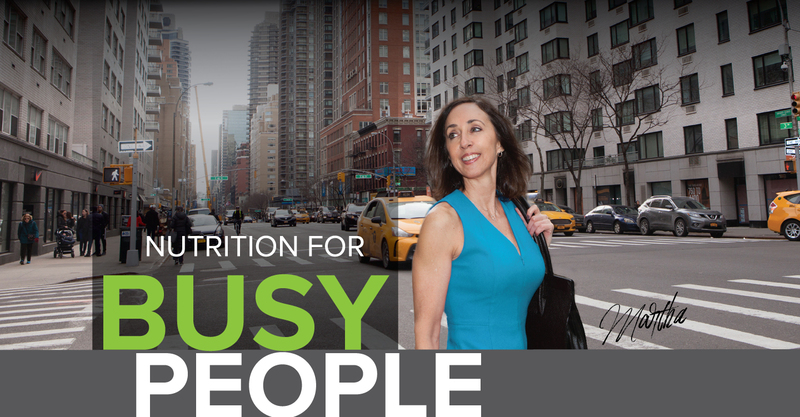 Learn how to maximize nutrition while being on the go! Is your organization a health innovator? I can help promote your brand through speaking, writing and even media appearances. discover how we can leverage sound nutrition science and years of experience to accomplish your goals!